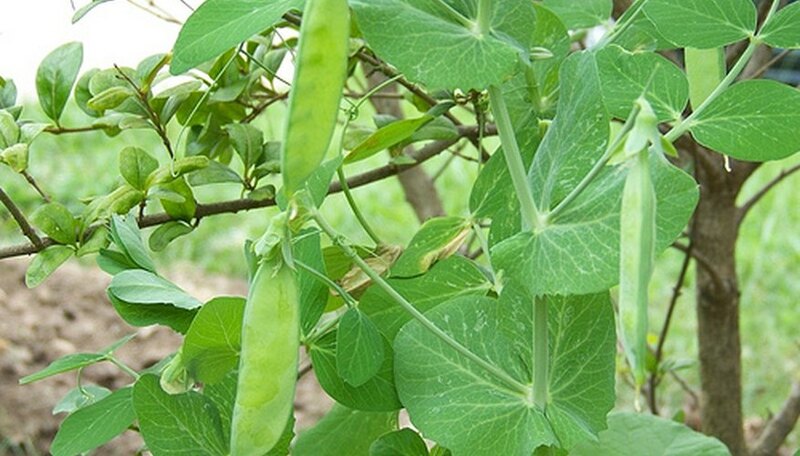 Peas fall into two main varieties, garden peas that need shelling, and edible-pod peas that are eaten shell and all. Snow peas, sugar snap peas and Chinese pea pods are eaten in the pod. They can be eaten raw or cooked. Garden peas, snap peas and snow peas are cool-weather vegetables suitable for the home garden in most parts of the U.S. Plant peas in the early spring or fall when they will enjoy a long period of cool weather. Choose a well-drained site with rich, sandy soil and plenty of sun. Peas prefer full sun or partial shade. Check the pH of the soil with a test kit, or by taking a soil sample to your local nursery or county extension. Peas prefer a soil pH of 6.0 to 6.7. Adjust the soil pH with lime to raise the pH, or acid-producing materials to lower it. Dig the soil well to loosen and aerate it. Work plenty of organic compost or well-rotted manure into the soil. Apply a garden inoculant to the soil or to the pea seeds before planting, or use treated seeds. Plant peas early in the spring once the soil temperature reaches 45 degrees F. Plant several successions to spread the crop out. Plant again in the fall, allowing plenty of time for your crop to develop before the first freeze. Plant pea seeds 1 to 1 1/2 inches deep in single or double rows that are about 1 inch apart. Provide support so your peas can climb. Peas are natural climbers and will produce better, and be less susceptible to rot, if they are able to climb a fence, trellis, poles or other support. Water the seeds thoroughly after planting and then keep the soil moist. Water the plants early in the day to allow the foliage to dry during the day. Watering at night promotes disease. Mulch the plants with about 2 inches of organic mulch to conserve moisture and discourage weeds. Hoe lightly or pull weeds when they appear. Peas have shallow roots and can be easily injured by aggressive weeding. Keep the weeds under control by frequent weeding or light cultivating. Watch plants for signs of nutrient deficiency. If you worked in plenty of organic matter before planting, there should be no problem. If your plants are yellow or not growing well, you may need to apply a light side dressing of fertilizer. Apply the fertilizer to the side and avoid direct contact with the roots. Harvest garden peas when the pods become full and plump. Hold the stem in one hand and pick the pea with the other hand to avoid damaging the plant. Pick the peas daily keep the plants producing and ensure that your peas are young and tender. Pick early for small, sweet peas, if preferred. Harvest sugar snap peas when the pods are fully formed and the peas are just beginning to plump. Snow peas are picked when the seeds just start to form, while the pods are still flat. Continue harvesting daily until the last peas are picked. Pull the plants up by the roots after the last harvest and compost them.